MINNEAPOLIS--(BUSINESS WIRE)--Sep. 15, 2016-- Sleep Number, the world's leader in sleep innovation, today announced the launch of the it™ bed, a revolutionary new smart bed that combines dual adjustability, sleep knowledge and connectivity for better sleep. The "it bed" will be available at www.itbed.com Sept. 19. The innovative "it bed" is delivered directly to doorsteps and compressed into a sleek box – but that is where similarities to bed-in-a-box brands end. Designed for today's connected lifestyles, the "it bed" is adjustable on each side and packed full of technology that helps consumers sleep better, and was the recipient of four technology and innovation awards at CES® 2016. And all these benefits come at great value – $1,099 for a queen. Sleep Number developed the new "it bed" brand for first-time bed buyers and digitally savvy individuals who recognize that quality sleep is essential to their life. "Your phone is smart, your TV is connected and your car has integrated apps; now it's time technology helped people sleep better. We are redefining what people should expect from their bed," said Shelly Ibach, president and chief executive officer, Select Comfort. "The ‘it bed' delivers an effortless buying and sleep experience. With this new brand, we are excited to offer the individualized benefits of a Sleep Number bed to a whole new generation of customers." Adjustable comfort – Unlike ordinary static mattresses, the bed's foam-filled air chambers adjust to each individual's idea of comfort and are controlled with a smartphone app. The bed contours to the neck, shoulders, back, and hips, cushioning and supporting the entire body for improved spinal alignment. Sleep tracking – Integrated within the bed's adjustable comfort are biometric sensors that track sleep. SleepIQ® technology continuously gathers hundreds of readings per second, monitoring sleep-critical variables (heart rate, motion and breathing), and a proprietary algorithm delivers a personal SleepIQ® score each night, which indicates sleep quality. 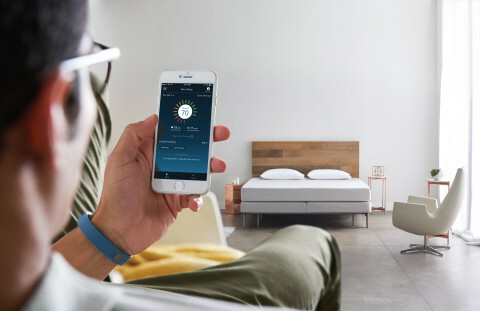 Connectivity – Through the SleepIQ® app, the "it bed" connects with leading health, fitness and sleep environment apps – including Fitbit®, Nest Learning Thermostat™, MapMyRun™ and Withings Health Mate™ – to show a holistic view of how lifestyle choices may affect sleep. Over time, SleepIQ technology learns each person's comfort preferences, understands how physical activity and sleep environment affects their sleep quality, and offers personalized insights for a better night's sleep. "Not all sleep is created equal," said Annie Bloomquist, senior vice president and chief product officer at Select Comfort. "By tracking and managing sleep-critical biometric data – and simultaneously connecting to popular health, home and environmental apps – the ‘it bed' is the future of sleep." When combined with Sleep Number dual adjustability, SleepIQ® technology helps customers understand what impacts their sleep and how to improve it, such as adjusting the comfort of their bed. The company's latest SleepIQ® software update is now available for download. The new enhancements include individualized sleep tips based on the users' personal data to drive an even better understanding of how to improve sleep. For example, "You have your highest SleepIQ® score when you go to bed between 10-10:30 p.m."
The new SleepIQ technology also connects to the customers' life so they know what is needed for their best sleep. SleepIQ® data coupled with their Fitbit® activities offer a holistic view of how a fitness routine impacts sleep. SleepIQ works with their Nest Learning Thermostat™ to identify the optimal bedroom temperature for sleep. The initial list of SleepIQ® API (Application Program Interface) data providers also includes Apple® Health, MapMyRun™, Microsoft® Health and Withings Health Mate™. Nearly 30 years ago, Sleep Number transformed the mattress industry with the idea that ‘one size does not fit all' when it comes to sleep. Today, the company is the leader in sleep innovation and ranked "Highest in Customer Satisfaction with Mattresses" in 2015 by J.D. Power. As the pioneer in biometric sleep monitoring and adjustability, Sleep Number is proving the connection between quality sleep and health and wellbeing. Dedicated to individualizing sleep experiences, the company's 3,600 employees are improving lives with innovative sleep solutions. To find better quality sleep, visit one of our more than 500 U.S. Sleep Number® stores or SleepNumber.com. Media Note: Supporting materials including images, videos, fact sheets and interview opportunities are available upon request.